This week, Elizabeth called for an end to violence against women and for closing the gender wage gap. She introduced her Private Member's Bill, C-387, to strengthen Canada's passenger rail service. She spoke strongly in favour of Mr. Boudrias' (MP for Terrebone) bill to restore public funding to political parties. She lent equal support to Minister Carolyn Bennett's Bill C-61, which transfers authority over schools and education to the Anishinaabek Nation. This newsletter covers Elizabeth's work in the House from December 4 to December 8. Elizabeth submitted five amendments to Bill C-55, An Act to amend the Oceans Act and the Canada Petroleum Resources Act, which went through clause-by-clause consideration at the Standing Committee on Fisheries and Oceans on Thursday, December 7. Two of her amendments were passed by the committee: an amendment to add that ecological integrity be used as a criterion to establish a Marine Protected Area, and an amendment to ensure that within networks of protected areas, each individual MPA has clearly identified objectives, and that the network of protected areas covers diverse habitat types, biogeographic regions, and environmental conditions. This marks an openness on the part of the Government to accept Green amendments. Elizabeth looks forward to working with Minister LeBlanc as Bill C-55 moves closer to becoming law. "Reconciliation, fairness top of mind for new Supreme Court nominee Sheilah Martin"
"The Pollcast: Can the federal Greens tap into provincial momentum?" 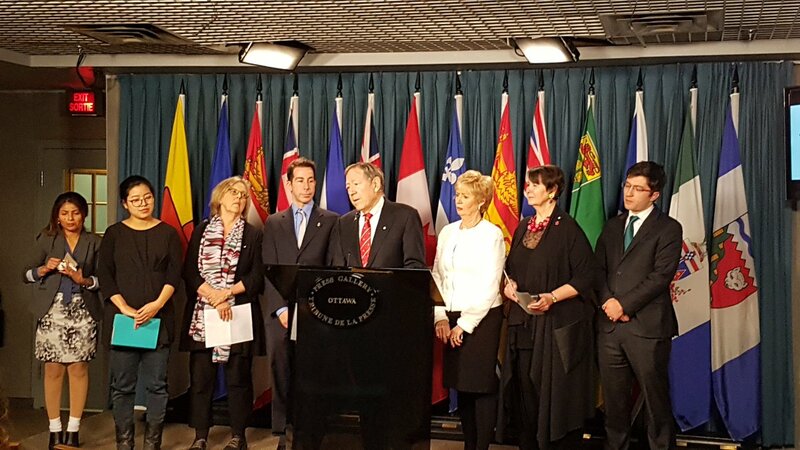 "Trudeau, returning from China, faces pressure to fight for political prisoners with links to Canada"
"Fisheries and oceans bill amended at committee"
Publicly request the government of the People's Republic of China to launch an independent investigation into forced organ harvesting from Falun Gong practitioners. Condemn the current practice in the People's Republic of China of systematically murdering Falun Gong practitioners.